We are very excited to share with you our new auto-optimization tool – BeMob Sixth Sense. This tool is aimed to save your time and identify the most effective optimization schemes for your advertising campaigns. At the core of this feature we have put the possibility of our tracker to analyze more than 2000 combinations of parameters and select the most profitable by revenue, CTR and ROI. The Sixth Sense report starts to generate automatically at 00:30 UTC every day. To access the report go to Sixth Sense tab on panel. To see the report for a particular campaign, you should go to the campaign list first, then select required campaign and press Report button. Click the Sixth Sense tab to see the required data for your particular campaign. Let’s have a look at the report results dashboard. 1 – Reporting day. The report will be based on data from one of the past 7 days or the 7 days in all. 4 – Report based on the worst or the best ROI, revenue and CTR combinations. The system generates six reports based on the best and worst combination of these params. 5 – Show or hide params in report. For instance, if you use the one traffic source for your campaign, you can hide the data on it to display the essential data only. 6 – Minimum amount of visits in the report. Use this option to find the most often repeated combination of params. 7 – The number of params for creating a combination. Use this filter to exclude duplicate rows based on the same repeated visits. 9 – The number of rows in the report. Select the columns to include the data from them in the report. Press the Refresh button to generate the report. The Sixth Sense technology involves user data received only from useragent, his location and traffic source parameters for analysis. 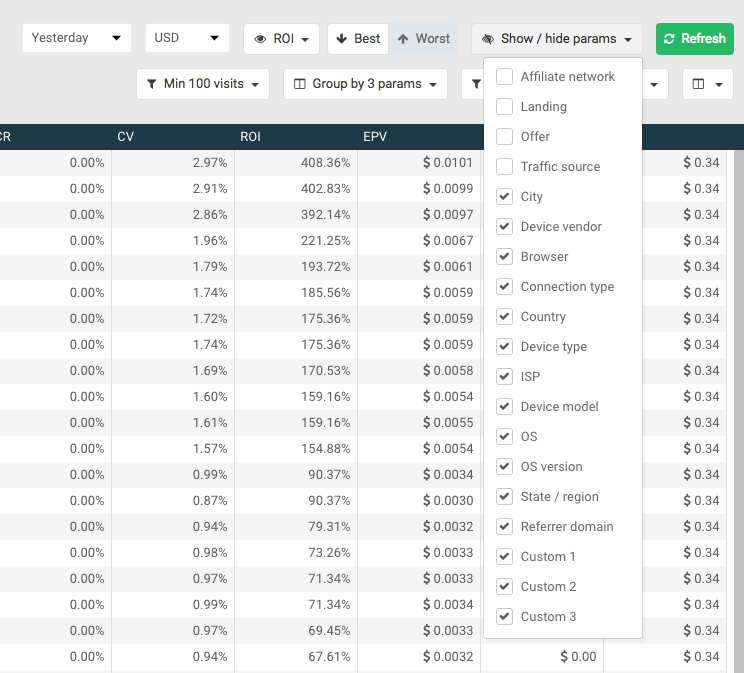 the data on affiliate network, offer, landing page and traffic source will be hidden – there is no need to display it in the report. We are sorting the results by cost to display the most unprofitable variations at the top of the report. You can see on the example above that the traffic with the params Device vendor = Samsung, Browser = Chrome и Device type = Mobile has 622 visits and no conversions. The traffic cost is $1.22. Basing on these data you should make a decision to block this traffic, if you want to reduce the expenses. 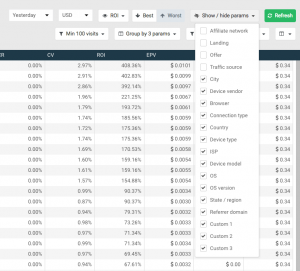 Note that the more data is analyzing in tracker, the more detailed and precise Sixth Sense report becomes, therefore the conclusion about campaign profitability should not be based on one or two conversions. Hope that Sixth Sense will help you in optimization your campaigns. If you have We will be glad to answer your questions!